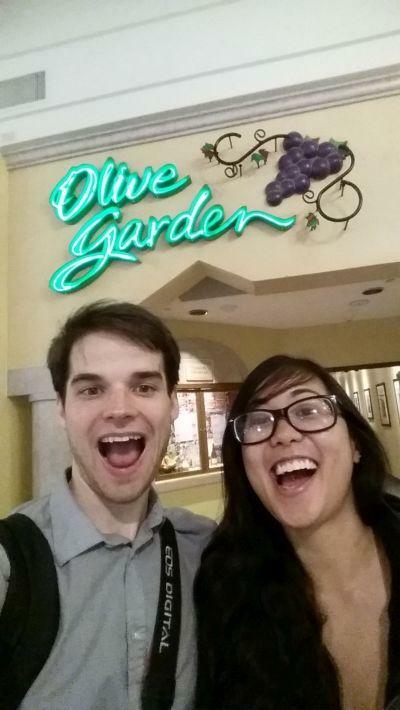 Feelings about the Olive Garden -- "It's, uh...it's okay!" She straightens out her dress, then smiles wryly. "You really ate that fast." I nod and say nothing for a while, because my mouth is entirely full of chicken. "Mm. S'been a while." From the start of the evening, the waitress likes her more than me, which is understandable. Katrina is the type of person who is immediately likeable. I had some reservations about this year's blog; what kind of people would I meet? Could I really share any values with people from a state so different than where I was raised? How awful is that gluten-free rotini going to be, anyway? Katrina allayed all my fears in one perfectly enjoyable evening. I look forward to seeing her again one day. Until then, though, there are 48 more dates.